The Iphigenia Project excavates the mythological character of Iphigenia from pre-classical mythology through Euripides’ plays and brings her into the twenty-first century. Iphigenia is portrayed as the first refugee of war and the central metaphor for questions of forced displacement in current global conflicts, the worst humanitarian crisis since World War II. To date the project has been presented in a series of multi-disciplinary collaborations, including site specific performance, a text/film essay, and several readings and presentations including a short film which premiered on Iowa Public Television in 2017. Iphigenia Point Blank, a film opera, the latest iteration of this project was recently developed in the 2018 Iowa Partnership in the Arts production at the University of Iowa, directed by Marion Schoevaert, with music composed by Kinan Azmeh, with filmmaker Irina Patkanian, violinist/performer Layale Chaker, with sets by Tae Sup Lee, lighting by Bryon Winn, and choreographer George de la Pena. Awarded a New York Foundation for the Arts Made in NY Award, Iphigenia Point Blank will premiere in New York City in 2020, produced by Nilou Safinya/Lailou Productions. Click here to read more about the performance. NEW YORK— Missing Bolts Productions (Blair Baker & Zac Kline, artistic directors) and NoPassport Theatre Alliance and Press (OBIE-winner Caridad Svich, founder) are curating a collection of new plays from noted international playwrights in response the shooting at Pulse Nightclub, June 12, 2016. Contributing artists include: Neil Labute (Reasons to be Pretty, Broadway); Anders Lustgarten (Lampedusa, Soho Theatre, London); Mia Chung (You for Me for You, Royal Court Theatre); Deborah Zoe Laufer (Informed Consent, Primary Stages); Caridad Svich (The House of Spirits, Denver Center); Rohina Malik (Unveiled, Victory Gardens Theatre); Oliver Mayer (Blade to the Heat, Public Theater); Winter Miller (In Darfur, Public Theater); Ken Urban (The Correspondent, Rattlestick Theatre); EM Lewis (Heads, Blank Theatre); Amina Henry (Animals, JACK); Migdalia Cruz (Miriam’s Flowers, Latino Chicago Theatre Company); Matthew Paul Olmos (2015 National Latino Playwriting Award), Saviana Stanescu (Aliens with Extraordinary Skills, Women’s Project Theater); Chiori Miyagawa (American Dreaming, Vineyard Theatre); Zac Kline (Messed Up Here Tonight, Renovations Theatre Company); Sung Rno (Cleveland Raining; Silk Road Rising Theatre); Stephen Sewell (The Gates of Egypt, Belvoir St. Theatre) and Anne Rumberger (Writer and publicist, Verso Books); Deborah Asiimwe (Cooking Oil, CalArts); Lisa Schlesinger (Celestial Bodies, Getz Theatre Chicago); Jessica Litwak (My Heart is in the East, La Mama ETC); Crystal Skillman (King Kirby, The Brick); Katie Pearl (Milton with PearlDamour); Jeremy O. Harris (Xander Xyst, Dragon: 1, Samuel French OOB Festival) Eric Mayer-Garcia (Louisiana State University); Ian Rowlands (Blink, national tour Wales and 59E59); Jacqueline E. Lawton (The Hamtpon Years, Virgina Stage Company) with more artist to be announced. 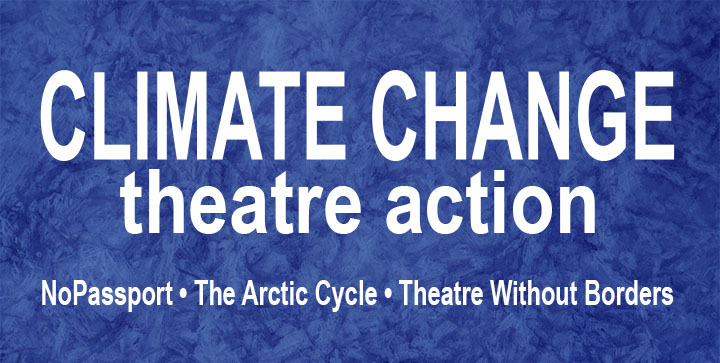 Climate Change Theatre Action is a series of worldwide readings and performances presented in support of the United Nations Paris Climate Conference (COP21). The main goal of the project was to invite as many people as possible, who may not otherwise pay attention to this history-in-the-making event, to participate in a global conversation. Modeled on previous NoPassport theatre actions focused on gun control and the aftermath of the Deepwater Horizon BP oil spill, CCTA drew on the expertise and resources of local artists, while being global in scope and uniting multiple countries and cultures around a common issue. A collection of 1-5 minute plays, songs and poems by writers from all six continents, curated by Caridad Svich, Chantal Bilodeau and Elaine Avila, was made available to producing collaborators worldwide. Over 100 collaborators in 25 countries agreed to host events which were registered with ArtCOP21 and, when technically possible, livestreamed on HowlRound TV.